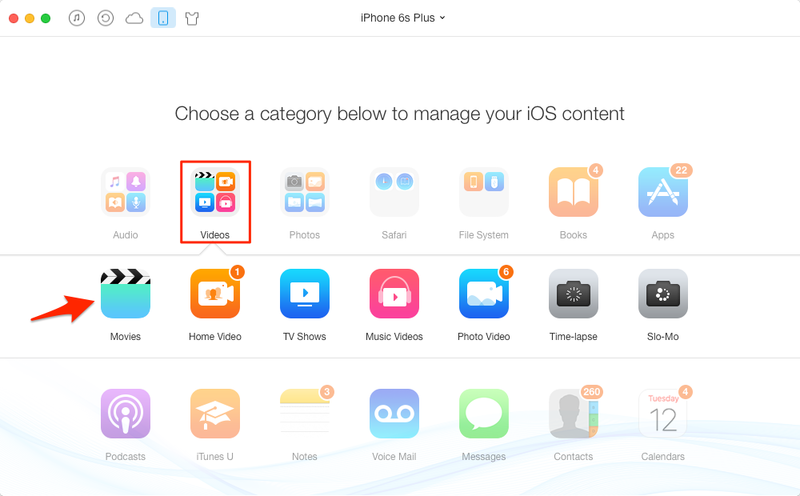 Want to Play AVI movies on your new iPhone 6s Plus? This guide will show you an easy-to-handle program that helps you convert and play AVI on iPhone with ease. 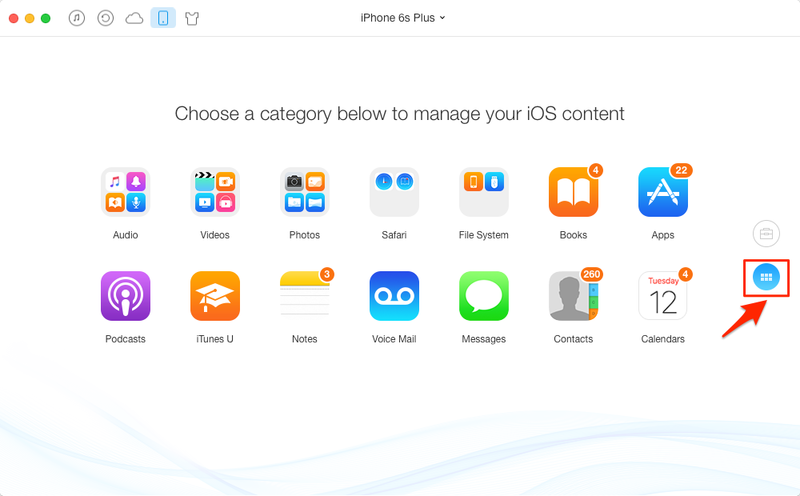 AnyTrans is the best tool to transfer and manage iOS files instead of iTunes. Download it to have a try after reading this guide on how to play AVI files on iPhone 6 or iPhone 6s. Audio Video Interleaved, known by its initials AVI, is a multimedia container format introduced by Microsoft in November 1992 as part of its Video for Windows technology. AVI files can contain both audio and video data in a file container that allows synchronous audio-with-video playback. AVI owns its time in 90' but it is still wildly used at present. Many video downloading sites provides free AVI movies. The big limitation of AVI videos is that, it is not friendly on an Apple device like iPhone. This tutorial will show you how to convert and transfer AVI videos onto iPhone, so that you will be allowed to play .avi files on the go. Get the best output quality without any manual setting - During the transferring, it will automatically optimize the video and audio quality according to your device's standard. 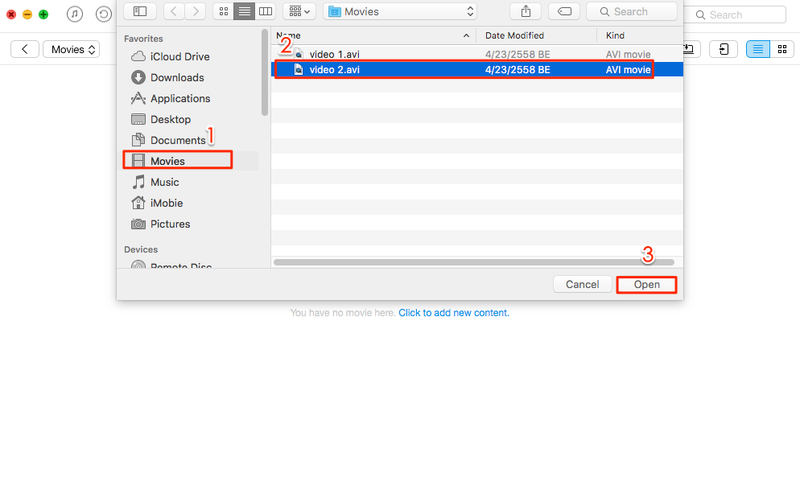 Import videos to iPhone without iTunes - adding an AVI video to iPhone with iTunes, you will be forced to replace old movies with new ones. AnyTrans is your iPhone Transfer software that helps you populate videos, music and Apps on iPhone without iTunes sync. Save 3X time to get this done - the up-to-the-minute Lightning interface and USB 3.0 just allow you to experience up to 3X as fast. To play AVI files on your iPhone, you need to convert the AVI movies to iPhone friendly format. The good news is that AnyTrans will automatically convert it to iPhone welcome format when transferring AVI to your iPhone. There are two versions of AnyTrans for you: Windows and Mac. Step 1. Launch AnyTrans > Plug your iPhone to the computer. You can set the video format you need AnyTrans to convert when transferring AVI files to your iPhone. 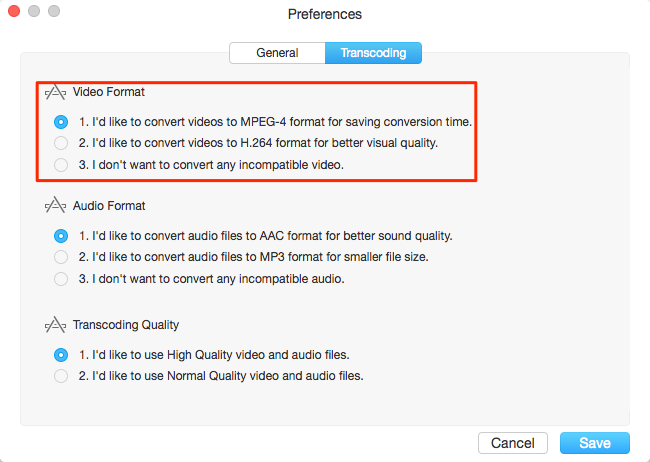 On Mac: AnyTrans > Preference > Transcoding > Video Format. On Windows: On AnyTrans homepage, click on the Settings area in the top left corner > Transfer Settings > General >Transcoding > Video Format. Step 2. Go to the window that AnyTrans classifies your iOS content. Step 3. Click on Videos and choose Movies. Step 4. Click the "+" button > Find AVI files on your computer > Click Open to add to iPhone. Then you can find the AVI files have been converted and saved to iPhone's Videos app. Note: If you lose some important videos from iPhone by accident, don't worry, read this tutorial about how to restore deleted videos on iPhone to retrieve them.